Being thankful and showing appreciation are well known for improving relationships and home life. But did you know that a habit of exhibiting gratitude at work is beneficial, too? Greater Good Magazine describes gratitude as something that uniquely “recognizes how the positive things in our lives—like a success at work—are often due to forces outside of ourselves, particularly the efforts of other people.” In a culture where self-promotion is a driving factor, gratitude is a transformational concept. So how exactly does it work? For an attitude of gratitude to take hold in a company, management must lead. 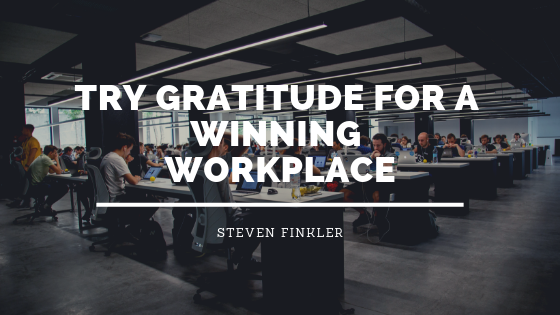 It certainly won’t happen overnight, but according to Forbes, a company-wide spirit of gratitude can be established quickly if the managers take the lead and point out a clear pathway for employees. Something as simple as a handwritten thank you note to an employee for a job well done or birthday cards from the CEO can go a long way toward leading employees to gratitude by example. Both big wins and small efforts by employees should be recognized. One way to gather a portfolio for gratitude is by collecting feedback in the form of surveys from customers or clients. If a customer has something positive to say about someone in particular, let it be known publicly that this employee made a positive impact for the company. Praise will not only motivate others, but it also keeps the team aware of the hard work that goes into providing quality service. The Forbes article made the point that to get the gratitude ball rolling, management might just have to say so. To make this shift in company culture, it is okay to think outside the box and get creative. Have a gratitude challenge, asking employees to share everything they are personally grateful for. Schedule a gratitude day when everyone says only positive words all day. Run as a company in a 5K for a good cause. Kathryn Petralia suggests that companies can match their employees’ contributions to a charity or have weekly town hall meetings where employees are regularly recognized for their efforts. Whatever it takes to transform your workplace into Gratitude Central, do it. Your employees will work harder, get along better, and be grateful for their job, their coworkers, and their managers. Steven Finkler has spent the past 25 years in the telecommunications field working for a variety of companies including, MCI Worldcom, Telco Communications Group, Teligent and AT&T. Finkler has worked through the ranks in all of these companies starting as an account manager, getting promoted to sales manager and eventually Director of Sales. Steven Finkler has been selected to AT&T’s President’s Circle for 15 years in a row and has been recognized by Randall L. Stephenson, AT&T’s CEO, as one of the most successful employees in their history. Steven Finkler is now a telecommunications consultant and entrepreneur, where he helps design, implement, and upgrade cost- effective telecommunication systems. His passion for telecommunications has led him to being an asset for large companies who are looking for someone who is a specialist in their field.